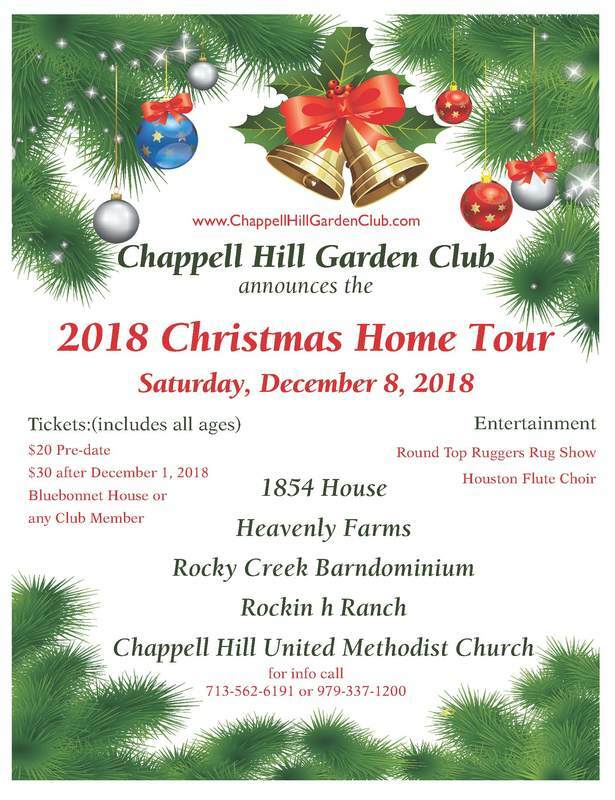 The Garden Club will present their second annual Christmas Home Tour December 14, 2019, featuring some very special homes in the Chappell Hill area. Tour Time is 10:00 a.m. to 5:00 p.m.
You can purchase multiple tickets. If you do not see a drop-down arrow in the "Number of Tickets" field, please select the field and you should see ticket options. Note: If you order tickets online, you may pickup your tickets and maps at Bluebonnet House and Garden Center* the morning of the event. ​For those that purchase tickets from CHGC members, you can also pickup your map at Bluebonnet House. Briannas - Del Sol Food Co.